The research of Driessens & Verstappen focuses on the possibilities that physical, chemical and computer algorithms can offer for the development of image generating processes. In these processes they aim for complexity and diversity in the conviction that chance, self-organisation and evolution order and transform reality. An important source of inspiration at this are the self-organising processes in our surroundings: the complex dynamics of all kinds of natural processes and the genetic-evolutionary system of organic life that continuously creates new and original forms. Sand and wind have expressive features, that can be experienced in its purest form in a desert landscape. The wind has free play with the loose sand that creates a vivid spectacle of ever changing formations. 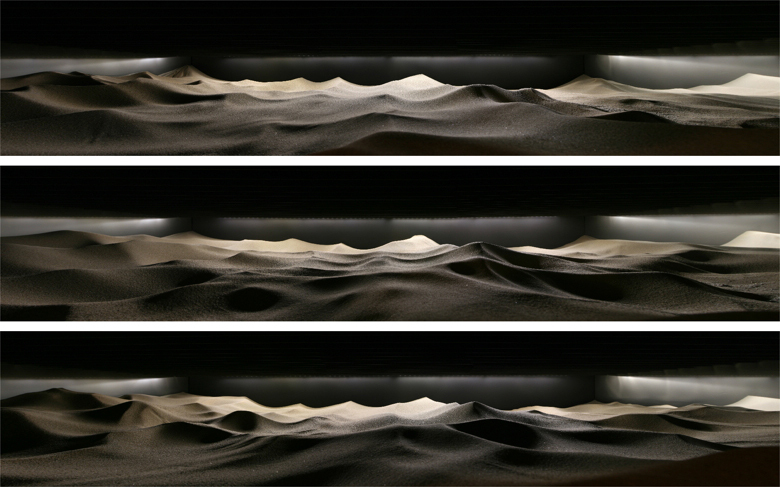 Sandbox is a diorama in which a sand bed is continuously transformed by means of wind. This process is visible for the audience through a small window. 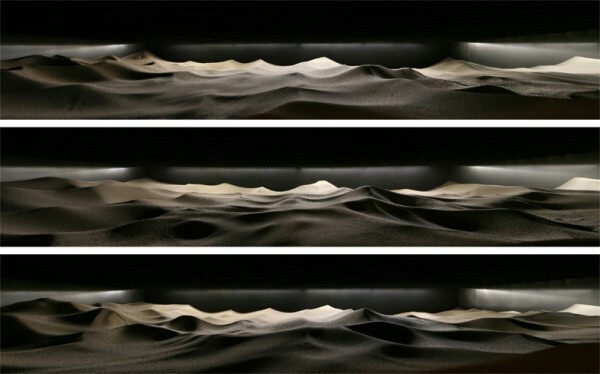 There is no intention of simulating a down-scaled version of an existing desert, but to build a generative system in which concrete materials like sand and wind are the shaping elements. By locking up these elements in a box an imaginary sight is created, a glimpse of a world where another climate prevails. Inside the box the basic facilities are installed: a thick layer of sea sand, the fans, electronics and lighting. In between the sand and the fans, a strip ceiling is hiding the fans from view. The fans are switched on and off individually by a custom designed algorithm. One can see rushing particles and sand drifts generating typical slopes. Now and then dust devils or avalanches will appear, or lees where lightweight particles seem to dance over the surface. The Amsterdam based artist couple Erwin Driessens and Maria Verstappen have worked together since 1990. 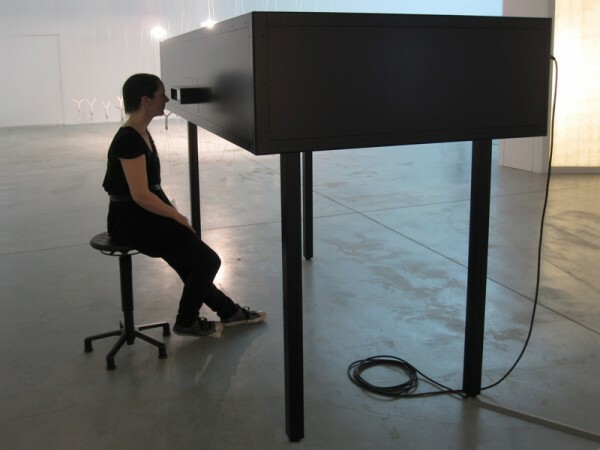 After their study at the Maastricht Academy of Fine Arts and the Rijksakademie in Amsterdam, they jointly developed a multifaceted oeuvre of software, machines and objects. Their research focuses on the possibilities that physical, chemical and computer algorithms can offer for the development of image generating processes. Driessens & Verstappen aim for complexity and diversity in the conviction that chance, self-organisation and evolution order and transform reality. An important source of inspiration at this are the self-organising processes in our surroundings: the complex dynamics of all kinds of natural processes and the genetic-evolutionary system of organic life that continuously creates new and original forms. Driessens & Verstappen participated in numerous exhibitions in galleries and museums, a.o. Stedelijk Museum Amsterdam, Museum Boijmans van Beuningen Rotterdam, Centraal Museum Utrecht, LABoral Gijón, IVAM Institute Valencia, Neue Pinakothek München, Eyebeam New York, DEAF V2 Rotterdam. The artists couple gave presentations at conferences such as Siggraph Los Angeles, Sonic Acts Amsterdam, Second Iteration Melbourne. In 1999 and 2001 their Tickle robot projects have been awarded first prize at VIDA, an international competition for Art & Artificial Life. 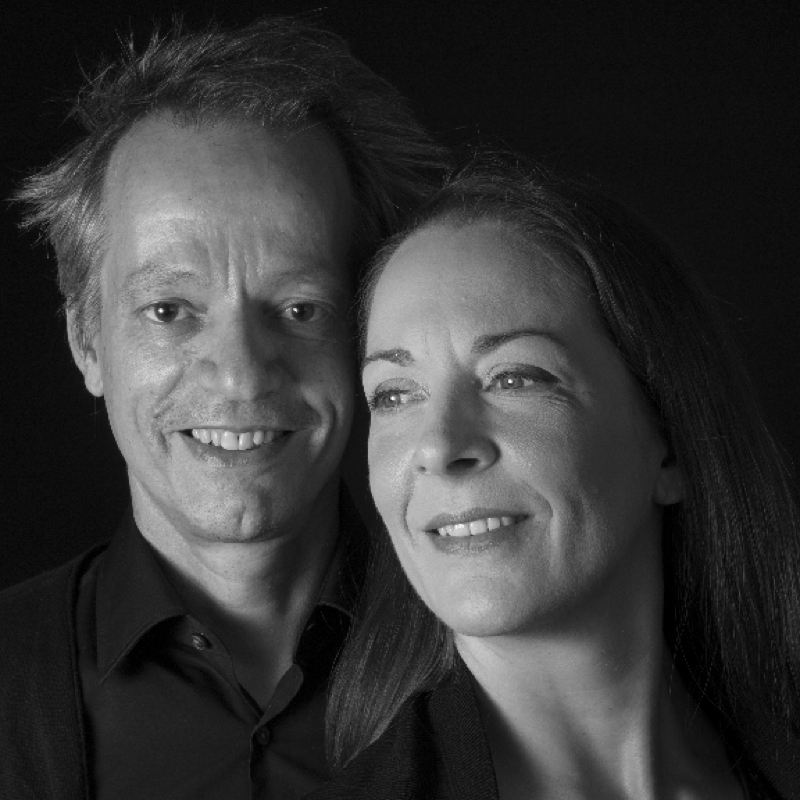 In 2013 the couple received the Witteveen+Bos Art+Technology Award for their entire oeuvre. Since 2001 the artists are represented by gallery VOUS ETES ICI in Amsterdam and since 2013 by gallery DAM in Berlin.